Photograph showing Ruby ____ and Josephine Miller (Lynn) being pulled on a sled by John Hoshour (1850-1925). The house in the background is located at the intersection of Spring and Muhlenberg Streets in Woodstock Virginia. It is where Josephine was born, grew up, and lived for her entire life. 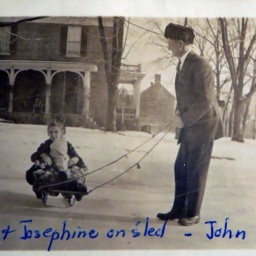 Unknown, “Ruby and Josephine on sled with John Hoshour,” Shenandoah County Library Archives, accessed April 19, 2019, http://archives.countylib.org/items/show/11406.